Includes: One (1) Third Brake Light for use onTiffin Motorhomes and several other makes and models of Motorhomes by leading RV manufacturers. Measures 15 1/2" long and 1 1/2 " wide. Center to center screw holes 14 1/2"
Includes: One (1) Stepwell Courtesy Light LED for use on many Holiday Rambler, Monaco Coach, Fleetwood RV Motorhomes, American Coach and several other makes and models of Motorhomes by leading RV manufacturers. Does NOT include: Adhesive/sealant, installation instructions or tools. Includes: One (1) Battery Cutoff switch for chassis for use on many Tiffin Motorhomes, Holiday Rambler, Monaco Coach, Fleetwood RV Motorhomes, American Coach and several other makes and models of Motorhomes by leading RV manufacturers. Includes: One (1) Battery Cutoff switch for house batteries for use on many Tiffin Motorhomes, Holiday Rambler, Monaco Coach, Fleetwood RV Motorhomes, American Coach and several other makes and models of Motorhomes by leading RV manufacturers. Includes: One (1) Third Brake Light for use on Tiffin Motorhomes and American Coach and several other makes and models of Motorhomes by leading RV manufacturers. Measure 25 3/4" in length. 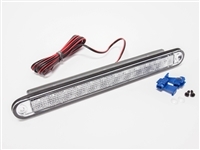 Includes: One (1) Third brake light for use on many Tiffin Motorhomes and several other makes and models of Motorhomes by leading RV manufacturers. 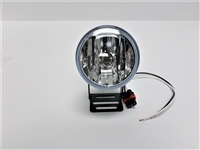 Center to center screw holes....9 3/8"
Includes: One (1) FOG LIGHT for use on many Holiday Rambler, Monaco Coach, Fleetwood RV Motorhomes, American Coach and several other makes and models of Motorhomes by leading RV manufacturers. Includes: One (1) Wiper Switch for use on Tiffin Motorhomes. Includes: One (1) Tail Light Drivers Side Inner for Bus. Measures at the highest side 13 1/2" and the lowest side is 11" and 9 1/2" wide. Includes: One (1) Tail Light Passenger Side Inner for Bus. Includes: One (1) Tail Light for Tiffin Allegro Bay and Phaeton motorhome. Does include: Gasket and back plate. Includes: One (1) Passenger Side Tail Light for Tiffin Allegro Bay and Phaeton motorhome. Includes: One (1) Tail Light for Tiffin Phaeton Motorhome.